The northwest Florida area has been identified as having the highest concentration of invasive lionfish in the world. Lionfish pose a significant threat to our native wildlife and habitat with spearfishing the primary means of control. Lionfish tournaments are one way to increase harvest of these invaders and help keep populations down. Located in Destin FL, and hosted by the Gulf Coast Lionfish Tournaments and the Emerald Coast Convention and Visitors Bureau, the Emerald Coast Open (ECO) is projected to be the largest lionfish tournament in history. The ECO, with large cash payouts, more gear and other prizes, and better competition, will attract professional and recreational divers, lionfish hunters and the general public. You do not need to be on a team, or shoot hundreds of lionfish to win. Get rewarded for doing your part! The task is simple, remove lionfish and win cash and prizes! The pretournament runs from February 1 through May 15 with final weigh-in dockside at AJ’s Seafood and Oyster Bar on Destin Harbor May 16-19. Entry Fee is $75 per participant through April 1, 2019. After April 1, 2019, the entry fee is $100 per participant. You can learn more at the website http://emeraldcoastopen.com/, or follow the Tournament on Facebook. 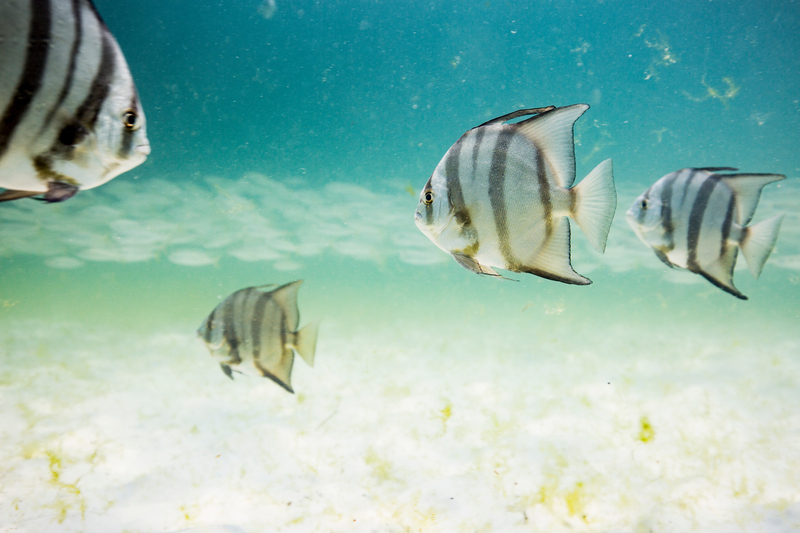 The Emerald Coast Open will be held in conjunction with FWC’s Lionfish Removal & Awareness Day Festival (LRAD), May 18-19 at AJ’s and HarborWalk Village in Destin. The Festival will be held 10 a.m. to 5 p.m each day. Bring your friends and family for an amazing festival and learn about lionfish, taste lionfish, check out lionfish products! There will be many family-friendly activities including art, diving and marine conservation booths. Learn how to safely fillet a lionfish and try a lionfish dish at a local restaurant. Have fun listening to live music and watching the Tournament weigh-in and awards. 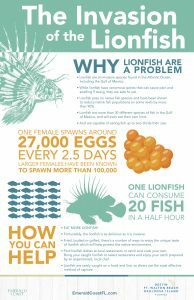 Learn why lionfish are such a big problem and what you can do to help! Follow the Festival on Facebook! It’s early morning as Dreadknot Charters speeds out of Destin Harbor towards the offshore reefs in the Gulf of Mexico. Researchers Holden Harris (Graduate Research Fellow, University of Florida), Alex Fogg, (Marine Resource Coordinator, Okaloosa County), and the Dreadknot crew, Josh and Joe Livingston, ready their equipment on board. 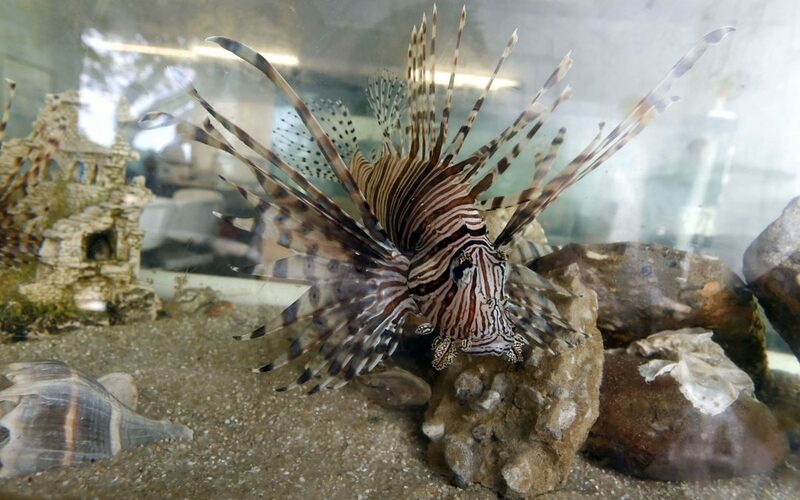 They’re working on a new method of capturing invasive lionfish: deepwater traps. Red lionfish (Pterois volitas / P. miles) are a popular aquarium fish with striking red and white strips and graceful, butterfly-like fins. Native to the Indo-Pacific region, lionfish were introduced into the wild in the mid-1980s, likely from the release of pet lionfish into the coastal waters of SE Florida. In the early 2000s lionfish spread throughout the US eastern seaboard and into the Caribbean, before reaching the northern Gulf of Mexico in 2010. 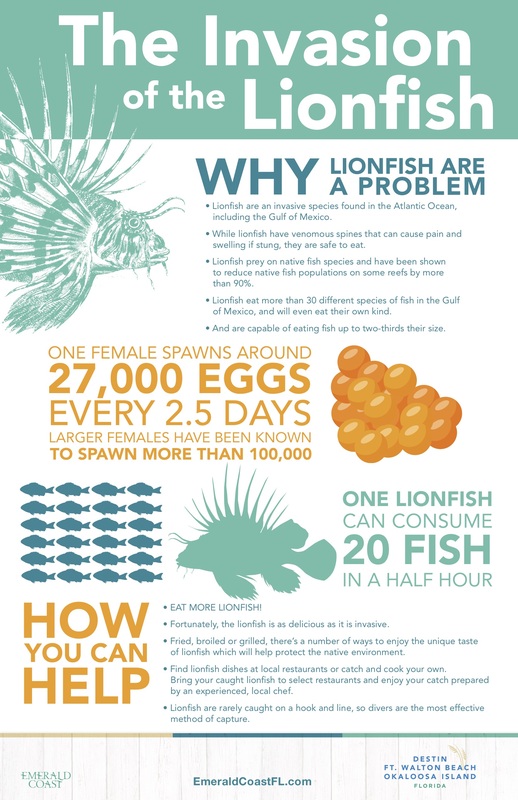 Today, lionfish densities in the northern Gulf are higher than anywhere else in their invaded range. Invasive lionfish negatively affect native reef communities. 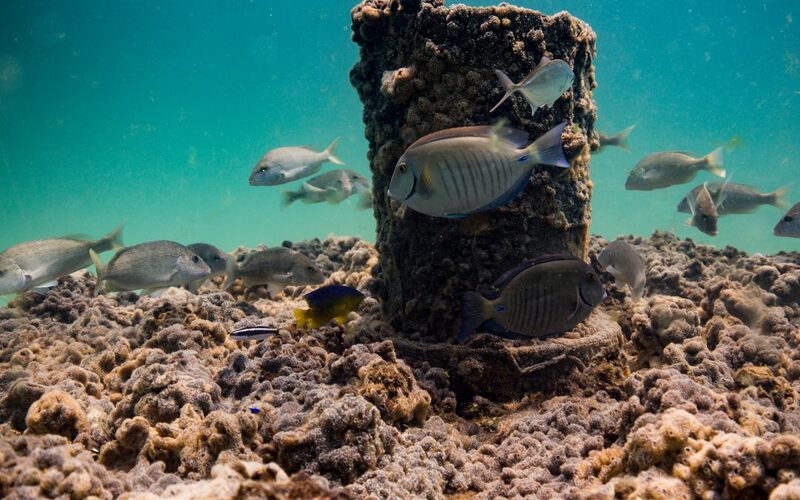 They consume and compete with native reef fish, including economically important snappers and groupers. Their presence has shown to drive declines in native species and diversity. Lionfish possess 18 venomous spines that appear to deter native predators. The interaction of invasive lionfish with other reef stressors – including ocean acidification, overfishing, and pollution – is of concern to scientists. Lionfish harvest by recreational and commercial divers is currently the best means of controlling their densities and minimizing their ecological impacts. Lionfish specific spearfishing tournaments have proven successful in removing large amounts in a relatively short amount of time. This year’s Lionfish Removal and Awareness Day removed almost 15,000 lionfish from the Northwest Florida waters in just two days. Lionfish is considered to be an excellent quality seafood, and they are now being targeted by a handful of commercial divers. Several Florida restaurants, seafood markets, and grocery stores chains are now regularly serving lionfish. While diver removals can control localized lionfish densities, the problem is that lionfish also inhabit reefs much deeper than those that can be accessed by SCUBA divers. Surveys of deepwater reefs show lionfish have higher densities and larger body sizes than lionfish on shallower reefs. In the Gulf of Mexico, the highest densities of lionfish surveyed were between 150 – 300 feet. While SCUBA diving is typically limited to less than 130 feet, lionfish have been observed deeper than 1000 feet. the fish inside and they are brought to the surface. The researchers are headed offshore to retrieve, redeploy, and collect data on the lionfish traps. 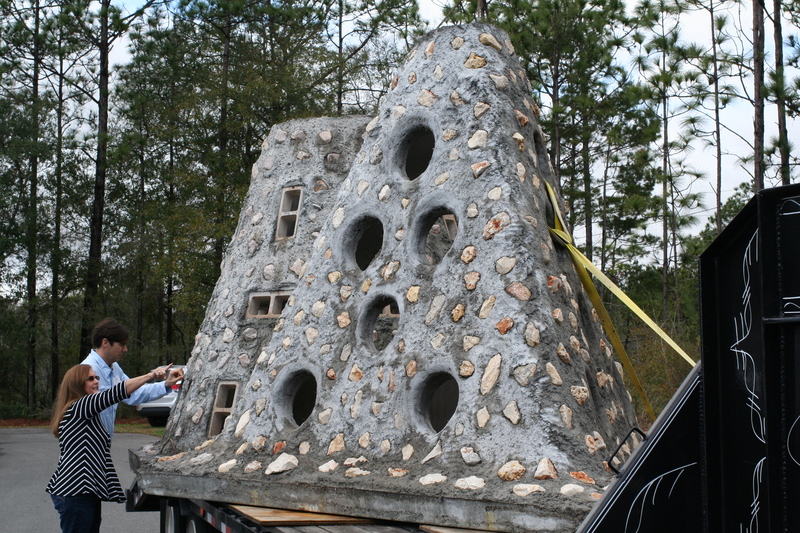 Twelve non-containment traps are currently being tested offshore NW Florida. 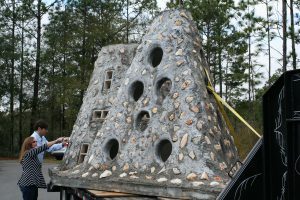 The research is supported by a grant from the Florida Fish and Wildlife Conservation Commission. 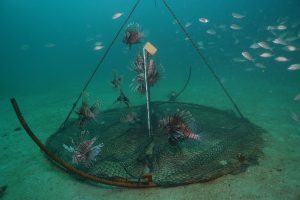 The study will try to answer important questions for a new method of catching lionfish: where and how can the traps be most effective? How long should they be deployed? And, is there any bycatch (accidental catch of other species)? Recent trials have proved successful in attracting lionfish to the trap with minimal bycatch. Continued research will hone the trap design and assess how deployment and retrieval methods may increase their effectiveness. If successful in testing, lionfish traps may become permitted for use by commercial and recreational fisherman. The traps could become a key tool in our quest to control this invasive species and may even generate income while protecting the deepwater environment. 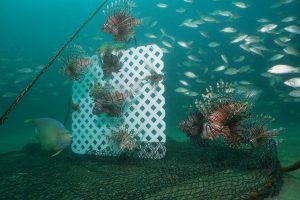 Outreach and extension support for the UF’s lionfish trap research is provided by Florida Sea Grant. For more information contact Dr. Laura Tiu, Okaloosa and Walton Counties Sea Grant Extension Agent, at lgtiu@ufl.edu / 850-689-5850 (Okaloosa) / 850-892-8172 (Walton).